Here's our guide on how you can revive your teammates, and bring them back from the dead in Apex Legends. If you think Apex Legends is just another battle royale game, then you're very mistaken, as Respawn introduces a bunch of fresh, new ideas that set it firmly apart from the competition. In this Apex Legends reviving guide, we'll be going over how to respawn in Apex Legends with the help of your teammates, who can use your unique beacon to get you back in the action. As we mentioned at the top, there are a fair few twists that Apex Legends introduces to the tried and tested battle royale formula. One of these is the ability to actually revive your teammates after they’ve died, so it’s actually possible for the player count in this battle royale to rise as well as decrease. When one of your teammates drops down to zero health in Apex Legends, they’ll be knocked down. You can then approach them, and hold down X/Square to begin the process of reviving them. If you can hold this button down for roughly 5/6 seconds without getting shot, you’ll bring them back into the fight. But if you fail to revive a teammate, they’ll die. Once a teammate dies, they’ll leave behind a crate on the ground, which you can approach and press X/Square to recover any items that they had on them. During this, you’ll automatically pick up the deceased player’s banner, an item that is unique to every player in Apex Legends. With this banner now on you, you need to go find a Respawn Beacon. 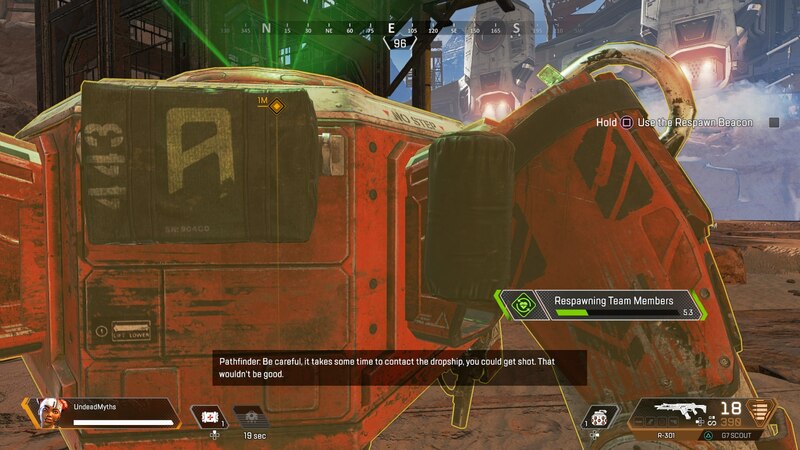 You can see an image of what a Respawn Beacon looks like just below, but crucially, they’re not marked on your map in Apex Legends, meaning you’re going to have to go out and find them for yourself. We should also add that the locations of Respawn Beacons are randomized between matches, so it’s incredibly unlikely that you’ll find a beacon in the same location over multiple games. But once you have found a Respawn Beacon, you need to approach it. Hold down X/Square for roughly 7 seconds, and you’ll begin reviving your teammate by filling up a bar. Once this bar is full up, the teammate will be dropped back into the action via a plane from above. Unfortunately they’ll respawn with zero weapons or other equipment items, so your revived teammate is at a bit of a disadvantage. Can you Respawn in Apex Legends? At the time of writing, there’s no possible way of respawning on your own in Apex Legends. If your squad gets wiped out during a match, then you’re all done for the game. Alternatively, you do need a nice teammate that’ll actually want to revive you, or you’ll be stuck watching them play. And this is all the information you need to know in order to revive teammates in Apex Legends. Now that we’re all wrapped up here, you can head over to our Apex Legends Heroes guide, or our Apex Legends Packs guide for more.